M. Jacqui Alexander, Professor at the Women and Gender Studies Institute, University of Toronto and Founding Director of the Tobago Center for the Study and Practice of Indigenous Spirituality (www.latierraspirit.org) will be reading from her new work. 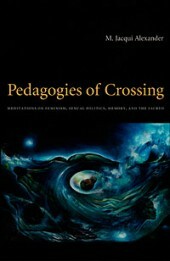 Author of Pedagogies of Crossing: Meditations on Feminism, Sexual Politics, Memory and the Sacred (Duke University Press, 2005): Co-Editor of Feminist Genealogies, Colonial Legacies, Democratic Futures (Routledge, 1997); Sing, Whisper, Shout, Pray: Feminist Visions for a Just World (EdgeWork, 2003). This event is co- sponsored by the Women and Gender Studies Institute and Caribbean Studies.